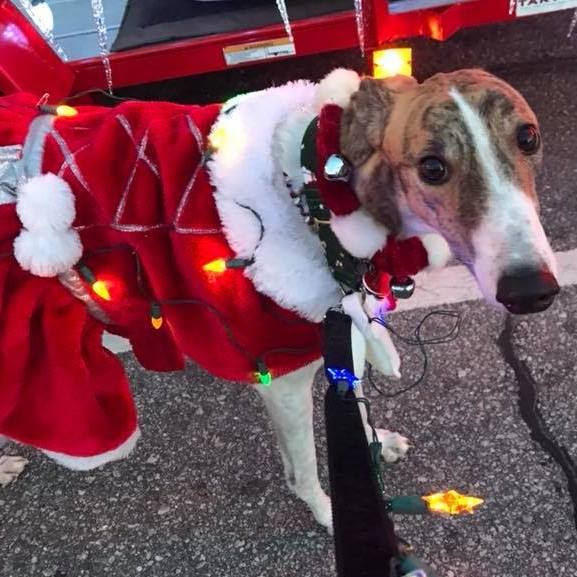 Merry Christmas, Happy New Year, and Happy Holidays to you, our Greyhound Friends of NC family! We’re proud to report 240 Greys found new forever homes in 2017 – this is the highest adoption rate since 2009! Together, our staff and volunteers proudly look back on over 24 years of Greyhound adoption, with more than 5,800 Greyhounds placed in homes. Volunteers continue to spread the word about these great companions. Many people come to the kennel and tell us “I met a Greyhound at a meet and greet” as these events are the first exposure they have had to the breed. Our website continues to be a portal for new adopters as well as a wealth of information for all. Our excellent reputation brings in new adopters, and brings seasoned adopters back again and again. We are a family and we’re glad you are a member! As we wrap up another successful year, our heartfelt thanks go out to Sally Barbour, our long-time volunteer coordinator who retired from the role late this year. Sally has put countless hours into ensuring our kennel is staffed with volunteers through heat and rain and snow – 365 days a year. Our volunteers logged 3,040 hours at the kennel this year! We are grateful to Sally for all her efforts – and we’re glad she will continue to volunteer with us at the kennel. We welcome Kayla Mulisano to the role of volunteer coordinator and we look forward to another great year. Check out the Volunteer page of our website to see how you can help. This year we held many events across our state – to both spread the word about the breed and raise funds to support our kennel. Examples include 10,000 Villages, Mountain Hounds, NC State Veterinary School Open House, Meet and Greets, kennel drop-in events, pet therapy visits, the online auction, Santa Paws, and much more – all these events are run by volunteers who donate precious time and energy to GFNC – and we need YOU to keep the work going. Contact our board members, volunteer coordinator, or Regional Contacts to get in the Greyhound groove in 2018. We need you to help us keep spreading the word, and we need you to help run Mountain Hounds – our biggest fundraiser and our biggest time commitment. Browse to the Team page on the website to find a contact near you. Without volunteers across the state, we can’t continue with all the events and meet and greet opportunities. Please reach out to see how you can help in your city. We are a state-wide organization and would be grateful for your assistance as a Greyhound ambassador. This year we launched our new, custom-engraved kennel plaques for purchase. Only 88 plaques will be made and placed on our kennel doors. See our site for details and to order yours today! 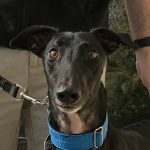 They make a special gift for the Greyhound lover in your life and are a unique way to support GFNC. Also, a very special thank you goes out to those who donated time and money to our efforts in replacing and renovating the tub/storage area. We have a new tub to bathe our Greys, and a sink in the restroom because of generous donations from our Greyhound family members. On behalf of the board, we at GFNC can’t thank you, our Greyhound Friends, enough for all your support over the past year. If not for you, we would not be able to continue to house and find homes for retired racing Greyhounds. Your funds support our efforts to house and feed our kennel guests and to educate the public about this special breed. As we close out another year, please consider making a tax-deductible donation towards our efforts. Merry Christmas and a happy Greyt new year from Greyhound Friends of NC.